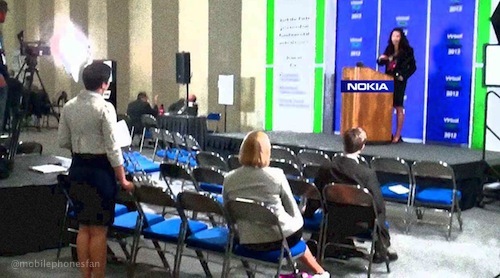 Nokia Conversations announces major changes to Nokia World 2012. 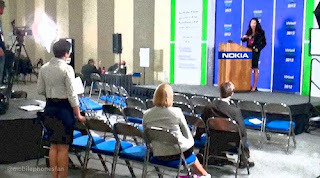 First held in 2006, Nokia World is traditionally a grand affair playing host to thousands of attendees -- a diverse group that includes Nokia's retail partners, mobile analysts, developers and journalists of all nations -- in a space suited to industry trade shows. So, in the interests of better corporate understanding, we'll translate. For clarity, Nokia's statement (below) is split up into concise segments. Their words appear in italics, with grey background; our text is in-between, set off with the caret symbol (>). MobilePhonesFan apologizes in advance, for any errors. We have made some changes to the format and date of Nokia World 2012. Instead of a single, large-scale event as we have had in years past, we will run a number of smaller, more intimate events with specific audiences in mind. > below expectations. Mr. Elop said a large hall might look rather drafty. Think less CES, more SXSW. > Forget stodgy old Symbian... Windows Phone is hip, baby! WooHoo! The first of these will take place in Helsinki on September 5-6. > Last year it was London, but then Lumia sales in the UK never took off. > cheaper and we can stuff the audience with employees, like Apple does. (A while ago we announced that it would be held on September 25-26, but the date has now been advanced by a couple of weeks. > the (rumored) Apple iPhone 5 event, in October. Sneaky, huh? This invitation-only event will cater primarily to our operator and retail partners. > is this means more room for you! That is, if you're invited. With these more intimate events we want to provide the most enjoyable and rewarding experience tailored for each audience. > Problem: We expect very low turnout, possibly due to cold & flu season. > Solution: 'Intimate events'. In a small hall, the event still looks crowded. Other Nokia activities will be announced in the weeks and months ahead. Stay tuned!